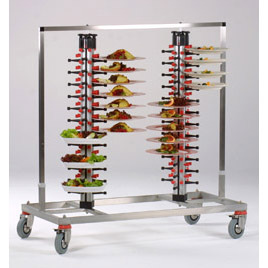 The columns on this 96 plate mobile banquet plate rack can turn independently of each other in the frame, full of plates, with a diameter of up to 33 cm. Solid stainless steel construction means this mobile plate tree will never rust and clean up is a breeze. The frame sits on swivel wheels with brakes on two of them. A protective cover is available for every Twin model. Our kitchen rack adjusts to fit nearly any plate size. If used properly you can tilt our dish racks up to a 20 degree angle, fully loaded, without dropping any of the 96 plates. 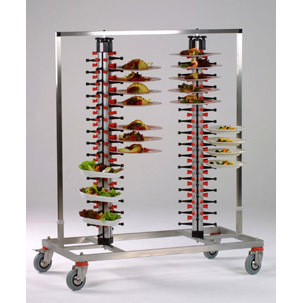 Our 96 plate trolleys are made from stainless steel and fully tested in professional kitchens throughout the USA. 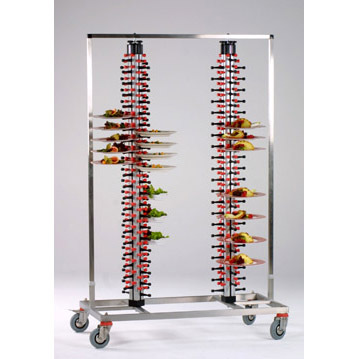 These racks are ideally suited for banquet serving and advance banquet plating.